Yes and because he was in a Land Rover, he was more likely to come out of it relatively OK. I am amazed that the Kia occupants weren't more badly hurt. All the more reason to NOT get a new car delivered asap to him. Seems ridiculous that at his age he even has access to car keys. I'm glad the two ladies and the baby are all relatively fine, it could have been much worse than it was, thankfully. ITA. thankfully, the other people weren't so badly hurt. All the more reason to be guarded heavily..What he is doing is dangerous.It is not a vision thing,its reflexes..even if the sun dazzled him he was not able to manage the car like a younger driver could. He can practise in his new car now although hopefully the protection officers will be driving it. Now I want a Land Rover. Even if you drive it semi-dead, you come out alive if it's flipped by another car in a collision. Impressive. Sarzy, lindsaywhit, Trixie and 1 others like this. roslyntaberfan and Trixie like this. I noticed that they didn’t mention insurance lol! Kittylady and Mrs Fawlty like this. This is more than likely not a standard model, however. It'll be armoured and reinforced. Brookie and Novice like this. Lofty Bike, Brookie, Oasis and 16 others like this. There was an old article on a Range Rover that they sold & it had details of the upgrades. Land Rover has one of the most awesome commercials ever, doing 99 turns on a mountain and going up 999 steps in China. A mother-of-two who broke her wrist after being involved in a car crash with Prince Philip has revealed how the Duke of Edinburgh has yet to apologise to her as he is pictured back behind the wheel. Emma Fairweather, 46, was a passenger in the Kia involved in the collision and described how she 'couldn't stop screaming' when it happened near the Sandringham estate in Norfolk last Thursday. Meanwhile, Prince Philip was pictured driving a new Land Rover just 48 hours after the dramatic crash. Images published on Saturday show him wearing dark glasses with no seatbelt in a new Freelander on the Queen's Sandringham estate. The Palace said contact has been made privately and 'well wishes' have been exchanged but the crash passenger said this was not true. Ms Fairweather from Kings Lynn in Norfolk said that she is 'lucky to be alive' and initially had no idea it was the Prince in the other car. The Kia Ms Fairweather was travelling in was being driven by her 28-year-old friend whose nine-month-old baby was also in the car. At the time of the crash her first concern, she added, was to scream for someone to get the child out of the back. She told the Sunday Mirror: 'We could see the Land Rover about 150 yards away from us at the junction, then it started to move. 'The speed limit was 60mph but my friend was doing no more than 50mph. I kept thinking he (the Prince) was going to stop, but he didn't. 'It all went into slow motion as I watched the other car. 'As we approached I could make out that it was an elderly driver. My friend was braking and seemed so in control but I was terrified. 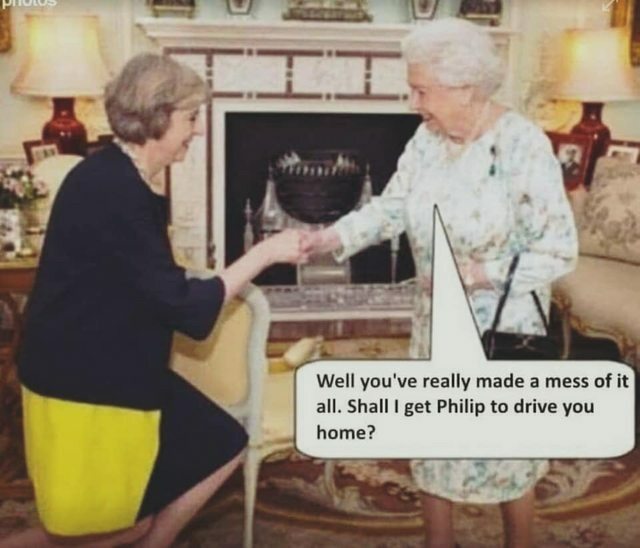 Ms Fairweather said Prince Philip received most of the attention from drivers who stopped at the scene since his car was on its side and she feared she would be left until passerby Victoria Warne, 72, got her out and explained who the other driver was. Witnesses said Prince Philip was whisked away ten minutes later. Ms Fairweather has not heard from the Queen or her husband, she said. She added: 'I know the Queen is a busy lady but I was really excited at the idea that she might phone me. 'Instead I got a call from a police family liaison officer. 'The message he passed on didn't even make sense. He said 'The Queen and Prince Philip would like to be remembered to you'. 'I love the Royals but I've been ignored and rejected and I'm in a lot of pain. 'It would mean the world to me if Prince Philip said sorry but I have no idea if he's sorry at all. The crash came for the 46-year-old whose birthday is on Sunday after a string of unfortunate life changes including losing her job and her marriage. It was claimed the Duke of Edinburgh may have been 'dazzled' by the sun but Ms Fairweather said it was overcast and 'grey' on Thursday afternoon as she and her friend drove home from Hunstanton beach. According to the Telegraph, Ms Fairweather's friends have claimed that she and the 28-year-old female Kia driver had been 'advised' by police not to talk about the collision. The two women inside the Kia were hurt but the nine-month-old baby boy was unharmed, police said. Mrs Warne's 75-year-old husband, Roy, helped the stricken Duke out of his car. He told The Sun that Philip, who was left very shocked by the accident, asked if everybody was all right and was overheard telling police he had been 'dazzled by the sun'. The crash happened as Philip's Freelander pulled out of a side road on to a stretch of the A149 which was earmarked by the local authority for possible safety measures. The Duke appeared to be travelling without a police protection officer - individuals who guard all senior members of the Royal Family when at public and private events. Buckingham Palace did not immediately comment on the images of Prince Philip driving.